Start­ing next week, every Mon­day will be my FIVE STAR READS day. I’ll talk about a book I’ve recent­ly read, or, maybe not so recent­ly read, that’s on my favorites list. What makes a book one of my favorites? Ummm… could be because I stayed up late at night to con­tin­ue read­ing. Could be because I absolute­ly loved the main char­ac­ters, or the plot, or the sen­ti­ment, or… Per­haps I don’t know exact­ly what it is that tips an enjoy­able nov­el over to the superla­tive. Like they say, my choice might not be your cup­pa tea. Even, on anoth­er day, it might not have been my favorite. But, rest assured, I’ll tell you what shiv­ered my tim­bers with each book. Like­ly it will be a mys­tery. But, not always. (I’m look­ing for­ward to list­ing a par­tic­u­lar mid­dle-grade nov­el.) I also like his­toric fic­tion, espe­cial­ly his­toric mys­ter­ies. A few romances res­onate with me (I have favorite authors). Often, a non-fic­tion will catch my eye. I like com­e­dy in sto­ries, but I appre­ci­ate good sus­pense as well. Come back on Thurs­day, and again on next Mon­day. 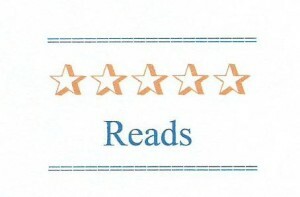 Hope­ful­ly, I’ll have refined my five star reads logo. And, hope­ful­ly, I’ll find out how to reor­ga­nize my first page to include an option to fol­low my blog, to short­en the list of past posts, and, pos­si­bly, even include oth­er options. What makes a book one of your favorites?